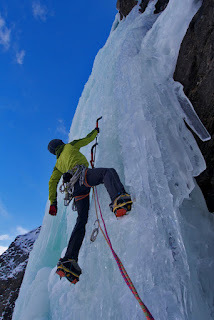 ally swinton blog: Some ice. 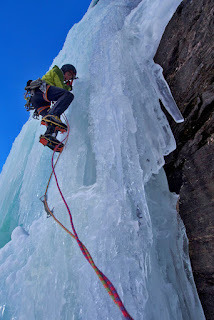 I managed to get a few good classic ice routes done at the start of February. Jon on the approach to Repentence. The first was Repentence WI6 in Congne. I went through early in the morning with Jon as he had to be back in the afternoon for a meeting. So we also took the approach skis the make things a little quicker on the way in but a lot quicker on the way out. Jon led the first pitch which is made up of these huge couliflower ice flakes. Which are good for hooking but you feel a little suspicious that they might snap off! 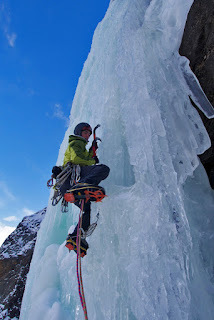 I then led the second pitch which was a fairly steady pitch. Jon then went for the third pitch which is the crux. As he got to the bottom of the main steep section he was greeted with a lovely waterfall pouring down the face, so traversed around and make a quick belay then I followed and Jon led off again. The climbing was almost like a small chimney then break out onto the face. We quickly rappeled down chucked the gear in the bag and made our way out of there. There just happened to be a break down in the tunnel as we approached it, which at first the said would be an hour delay. At first Jon was worried about his meeting but then realised that this meant we had time to grab a beautiful slice of Italian pizza. 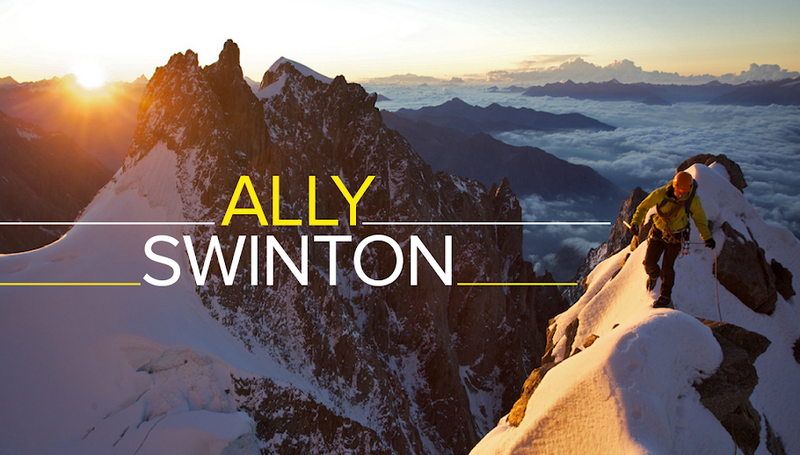 The next day I went up to Grandes Montes with Ally Fulton and Andrew Inglis. We headed for Nuit Blanche which is one of the classic ice routes of the Chamonix area. Andrew climbed the first pitch which felt like a climbing wall as it had these weird blobs sticking out and weaved around a bit. Then Ally went for the second pitch which has a steep exit that you have to turn. 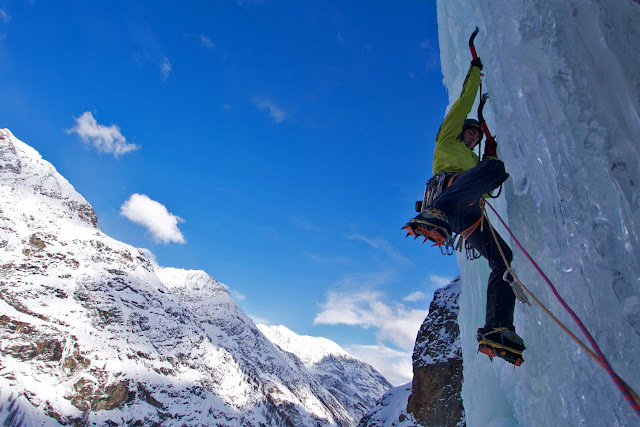 Great classic route that is so easily accessed. Andrew leading the 1st pitch of Nuit Blanhe. Ally seconding the 1st pitch. 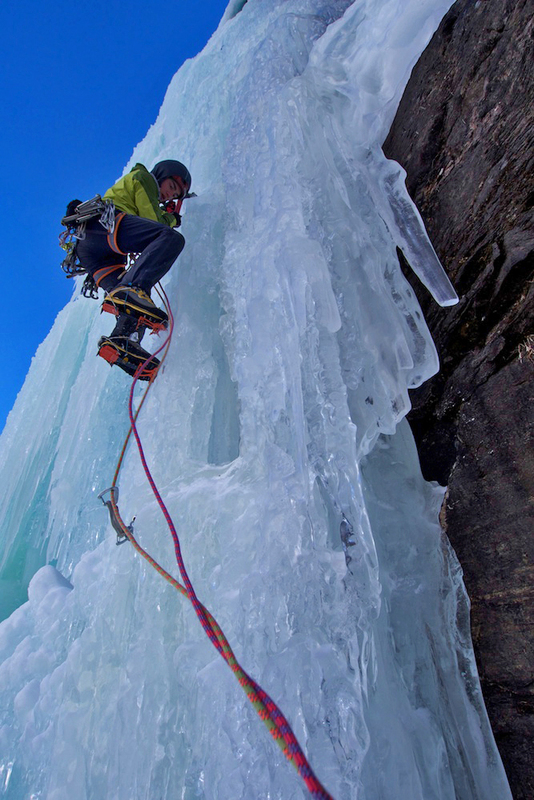 I've got a lot of improvement to make at ice climbing. It stills feels a bit weired to me. I'd be happy on any sort of mountain ice but there just seems something a bit funny about waterfall ice climbing to me.